Subscriptions are now open for the 2017 ZEN BOX. Members get 3 therapeutic-grade essential oils bi-monthly with education on how to use them, secret discounts, bonuses and a new podcast. Learn how to use essential oils, collect therapeutic-grade product and have fun while improving wellness: that's ZEN BOX! Essential oils are a natural and healthy way to approach common problems and issues in daily life; from disinfecting a cut to helping fall asleep, reducing stress, or supporting a stronger immune system. 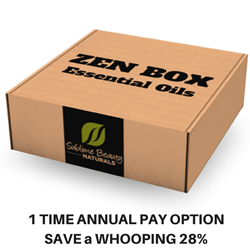 ZEN BOX delivers valuable essential oils along with education and profiles of each oil, bonus items twice yearly, a new monthly podcast, free shipping in the US, an anytime 25% Off discount at Sublime Naturals and deeper 35-40% Off discounts in the "no-box" months. Starting in 2017, members get VIP Zen Points with every charge or recharge of the box, and for any purchases made for impressive savings. "ZEN BOX is a great way to build a collection of essential oils, really know what they do, and improve wellness," says Kathy Heshelow, founder of ZEN BOX and Sublime Naturals. Heshelow is also author of "Essential Oils Have Super Powers." Subscriptions are now open for 2017 at Sublime Naturals. A special 28% Off discount is offered to those who sign up for the annual one-time payment. Opt in for an immediate video presentation about essential oils and ZEN BOX features here. The first box ships February 5th with deadline to sign up midnight February 1st. However, early subscribers get bonuses.